Sandra Brown was the first to autograph my edible bookmark poster my first year at RT Booklovers. I was a fan long before I met her and was in awe at how gracious and kind she was. 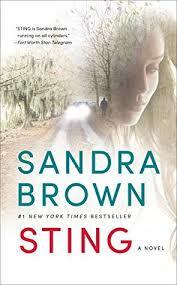 I mean, it’s Sandra Brown–best selling author, forever. A master at romance and suspense combined, she weaves a tale with twists that keep you intrigued page after page. In the case of Sting, I just knew there was something off about the protagonist. Shaw Kinnard, a hit man, hired to kill the sister of a genius money launderer and scammer, he seemed principled. What contract killer who accepts a job to off a woman feels remorse when he realizes that his flexicuffs are leaving scars on her wrists? Jordan (Jordie) had spent her life ‘protecting’ her little brother from the choices he’d made. Out of a sense of misplaced guilt for a childhood accident, the consequences she suffered for her misguided love were grave, to say the least. When the mobster her brother has gotten into bed with decides that taking her out is the best way to gain revenge on her rat brother, she once again can’t completely turn her back on him–even if it may cost her, her life. One of the things that I always grapple with in any book is character connection. I need to like someone in a book–anyone. And in this one, I struggled early on. There was little to like about the hitman, the kidnapped, and certainly not the weasel brother. The FBI agents on the case had promise, but it wasn’t enough out of the gate and so it took me longer to finish this book than usual. However, Brown’s storytelling kept me intrigued enough to want to know what happened to everyone. And the slow underlying sizzle she built between Jordie and Shaw had me wondering if Stockholm Syndrome was surely to blame for the stolen kisses and pulsing heart rates. I liked where the story landed and the unexpected paths it took to get there. The characters grew on me and the plot was solid. Unfortunately, it was a little slow in character development. It seemed you were plunged into a world with a bunch of people you had cursory knowledge of and no build up to make you care about them. They fell flat and it wasn’t until halfway through the book that you actually cared anything for any of them. That short-coming aside, Sting was a well-written “somewhat romantic” suspense novel that keeps you wondering until the last page. You definitely don’t see the ending coming–at least I didn’t. It was worth pushing through the first half to get where it was going.